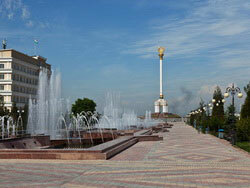 Dushanbe is the largest city of Tajikistan, political, economic and cultural center of the country. Officially, Dushanbe obtained the status of the city only in 1925, but archaeological research suggests that the settlement on the site of the modern city emerged in the great antiquity. The word Dushanbe, which is Tadjik for Monday, derives from the fact that Dushanbe grew on the site of a village that originally was a popular Monday marketplace. In 1929, Dushanbe was renamed Stalinabad after Stalin and bore this name for 30 years. Modern-day Dushanbe is a scientific, intellectual and cultural center of the republic. There is the Academy of Sciences of Tajikistan, 17 research institutes, 17 universities, 8 theaters, 8 museums, 3 cinemas, 4 libraries in Dushanbe. Various cultural and educational events forums, symposia, exhibitions, scientific conferences are regularly held in the capital. There is a number of stadiums, swimming pools, fitness centers, casinos, restaurants here. The town itself is very green with beautiful parks, lakes and interesting architecture. 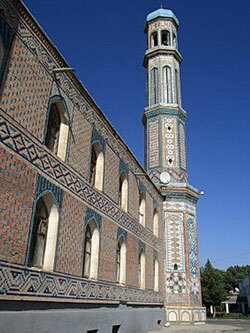 In 2004, by decision of UNESCO Dushanbe was declared a city of peace. The climate is continental and has the hot, dry summers typical of the region and cool wet winters. Average annual air temperature is 14,7 °, with an average January temperature -20° C, and +40 ° C in July. The best time for Tajikistan tours are March/April and September. The population of Dushanbe is 679.4 thousand people. According to census data principle ethnicities being Tajiks (83,4%), Uzbeks (9,1%), Russian (5,1%), others (2,4%). There are a lot of beautiful buildings in the city Government House, teahouse Rohat, building of Aini Opera and Ballet Theatre with its majestic columns, Firdausi National Library. There is the largest in the city Behzod historical museum of Fine Arts at one of the most beautiful squares of the city. Another characteristic feature of the city is its monuments to the great Tajik thinkers and philosophers like Ferdowsi, Rudaki, Avicenna and Aini. Dushanbe is developed industrial center of Tajikistan. A leading cotton textile center, Dushanbe also produces silk, machinery, electrical appliances, clothing, leather goods, tractor parts, and foodstuffs. There are about 90 industrial enterprises in the city. The first record of Dushanbe dates back to the XVIIth century. In some sources, it is called kasabai Dushanbe, what reflects its city status. But in accordance with numerous finds of archaeologists, ethnographers, historians, made recently in the territory of modern Dushanbe, the age of the city is much older.